Trouble Getting Approved in Wisconsin? Summary of Wisconsin Usury Law(s) / Quote: "Legal: 5% / Contract: Any rate not exceeding various statutory maximums / Judgment: 12% / Corporate: No special rate"
Legal Maximum Interest Rates: Quote: "5% unless otherwise agreed in writing (§138.04)"
Usury Penalties: Quote: "Lender intentionally violating fined $25 to $500 and/or prison up to 6 months (§138.06(2))"
Judgment Interest Rates: Quote: "12% (§815.05(8))"
Legal Exceptions: Quote: "State-chartered banks, credit unions, savings and loans, etc. (§138.041); residential mortgage loans (§138.052(7)); loans to corporations (§138.05(5)); installment contract on auto (§218.0142)"
Chrissie is about to inherit some cash from her grandmother’s estate and she would like to borrow the money in advance to help her pay off some of her debts. Her grandmother passed away a few months ago and according to the will she left Chrissie some money and other heirlooms that she wanted Chrissie to have. She knew Chrissie was having financial problems and wanted to help her out. According to the will she will receive over $20,000 in cash once the will has been probated and the assets sold to generate the cash that is to be paid out. It is taking somewhat longer than Chrissie anticipated since the courts had to step in and probate the estate. She is hoping that she will receive the money in a month or two months at the latest. Chrissie is applying for this bad credit loan on the basis that she is to receive this money and she really wants to repay all of her debts as soon as possible. She has missed payments and also declared bankruptcy a few years ago and had a lot of financial difficulty at that time. With this money she can catch up on everything and repay the loan in a month or two. She would like to borrow $15000 on a four year term. She only plans to have the loan for a couple of months and then repay it in full. This is really a high risk bad credit loan as far as the lenders are concerned. Chrissie does not make sufficient income to cover this loan and her other monthly rental and utility payments. She would be unable to meet the terms of this loan without the gift from her grandmother’s estate. She also has debt that she must repay although the loan would cover this debt. She does not have a good credit score and she does not have a very good history of repaying loans, given her bankruptcy a few years ago. It is very unlikely that anyone will approve this loan request under the present circumstances. They might consider her loan if she can provide some kind of documentation that shows she will inherit the cash she needs to repay the loan. A letter with a copy of the will from the lawyer or the executor who is handling the will might be accepted. Although this would be highly unusual it might be considered. Another issue the lenders wonder about is why not wait until she receives her portion of the inheritance and then repay what she owes. At most it will be a couple of months and will not cost her that much in interest charges on her debt. She could avoid the bad credit loan altogether. Chrissie is considering her options and will decide what to do in the next week or so. If you live in the State of Wisconsin and you're struggling to get a loan approval with a bad credit rating we hope our website helps you in some way. 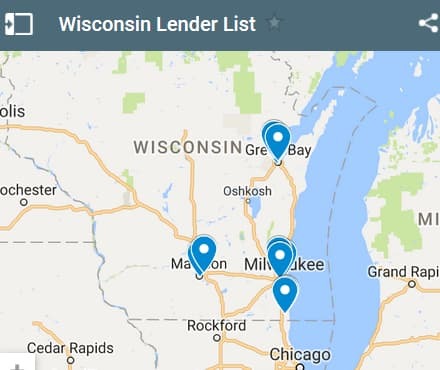 Last 5 debt service loans approved in the State of Wisconsin. Source: WFL Lender Pool. Updated Weekly. Principals rounded to the nearest $1000. Relative interest rates listed below in order left to right. 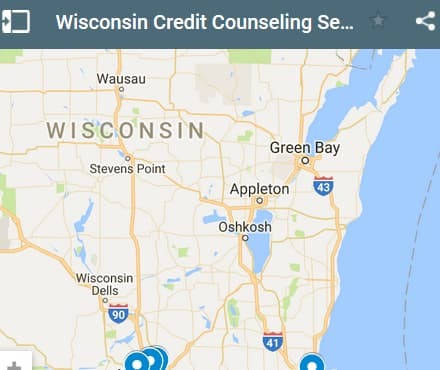 Wisconsin borrowers maybe better served to first consult their own local bank or credit union before using online services. It's always the best bet to check with the people in your local community. However, if all else fails locally, you can use the form above in your effort to find a local or national lender who provides debt consolidation loans that are unsecured. If you have some sort of collateral asset, that will help even more. Phillipe is facing many payments every month and he is having trouble balancing all of the payments and meeting the dates that each one is due. He is juggling his cash flow to try to avoid late payments. He has used cash advances from his credit cards to pay one card when it is due and then reversing the payment a week later to pay off the other credit card. He has used pay day loan services, but found they were even more expensive than cash advances from credit cards. He no longer has this type of loan. He also has a car payment in addition to regular rent payments and utility payments. He almost missed a rent payment. He had to take a cash advance from a credit card to pay his rent. While he is successfully juggling his payments, it is getting more difficult every month. With the extra interest payments on the cash advances, his cash flow is getting worse not better. Phillipe understands that each time he takes a cash advance, interest is charged immediately at 21 % on the cash advance and also any unpaid balance. He seems to be always paying interest. He would like to be approved for a loan of $4000 and repay it over 2 years. With a lower interest rate and regular payments, he is hoping to get his budget and cash flow under control. He wants to get out of the cycle of using cash advances to meet his budget and cash flow issues. Phillipe is using cash advances from his credit card as an expensive loan service to help him pay his bills and manage his cash flow. What Phillipe is doing is actually quite common. Many consumers having no choice, unable to pay their bills, are using cash advances to meet short term financial requirements. Even though it is very expensive, and interest charges are high, they feel they have no choice. They need to meet a bill payment requirement or risk lowering their credit scores, collection action or even repossession of vehicles. In many cases the situation just gets worse due to the added expense of interest charges. Phillipe’s credit score is still average and he has not seen his credit score impacted because he is meeting all of his payment requirements. His credit utilization is pretty high. If he were able to repay his credit cards and keep the balances at zero with a loan, his credit utilization would be lower and his credit score would actually improve. The best approach for Phillipe is to use this debt consolidation loan to repay all of his debts and then focus on repaying the loan over a two year term. He will need to make sure that he maintains a zero balance on his credit cards or risk finding himself in the same situation within a few months. 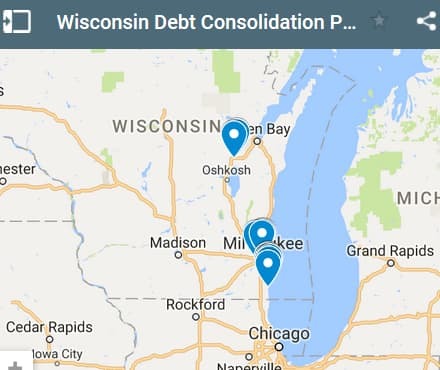 If you live in the State of Wisconsin and you're trying to get approved for a debt consolidation loan, we hope our website helps you find a good lender regardless of your credit rating.